ST. GEORGE – What do you get when you mix four young men, the entire works of William Shakespeare and a time limit of 97 minutes to do it all? An evening of laughs, entertainment, and an irreverent look of the works of William Shakespeare. Desert Hills High School presents the play The Complete Works of William Shakespeare, Abridged, a 97 minute look at William Shakespeare, “if written by Reader’s Digest, acted by Monty Python” and the speed of a waltz done in a minute. Opening Wednesday and running through Saturday, Jefferson Beatty, Austin Behymer, Andrew Leavitt, and Dallin Suman take you through 37 plays of Shakespeare in a fast-paced, witty and physical evening of laughter for all theater enthusiasts. Involving the audience in Hamlet, a cooking show with Titus Andronicus, all of the comedies written as one script and the histories performed as a football game, the play offers an evening of pure entertainment. 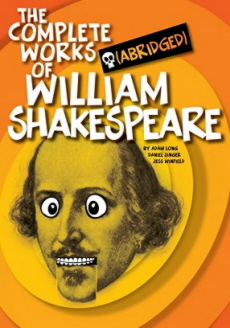 The Complete Works of William Shakespeare, Abridged has become one of the world’s most frequently produced plays and has been translated into several languages. Don’t miss this great evening as four talented young men tackle all of the works of William Shakespeare. Beginning at 7:30 pm in the Little Theatre at Desert Hills High School, mark your calendars for the 17, 18, 19 or 20 of September to attend this fun look at William Shakespeare as you have never seen him before. With all seats $5, arrive early as seating is limited for one of the most entertaining evenings you will have this year.